Yesterday a flood of over 400,000 people descended on the streets of New York city. Banging on drums, singing out chants, and displaying signs of all shapes and sizes, the attendees of the aptly named "People's Climate March" lent their voices demanding action on the tragedy of the commons we are currently witnessing in our changing world. Citing frustrations with the current international inaction on climate change by world leaders, citizens of the world from as far away as France, Rome and Papa New Guinea joined in this single act, creating the largest climate demonstration of its kind. This event seemed like the culmination of disappointing and anger at the ineffectiveness of conferences like Kyoto, Copenhagen, Cancun and Durban mixed with similar attitudes towards their own governments. 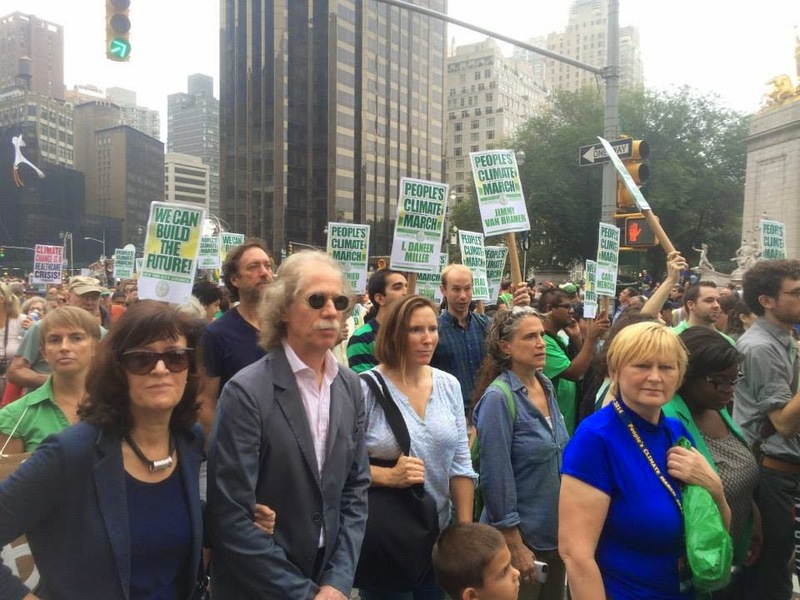 The roughly four hundred thousand attendees in New York were joined in 24 hours of demonstrations world-wide calling for real action in response to the pending United Nations Climate announcement beginning tomorrow. Attendees ranged not only in origin but backgrounds as well. Reports of contingents representing Hurricane Katrina victims, the ocean, climate scientists, and VIPs. Officials and activists like Al Gore, UN Secretary Ban Ki Moon, John Kerry and activist/movie star Leonardo Di Caprio were a few of the multitudes who took to the street. Organizers and leaders at the event called on participants to not only take action, as Bill McKibben and a panel urged, but to also pay attention on the issue of dirty money in politics. The event triggered huge media attention including 24 hour live blogging by the Guardian and the NY Times and the 1,400 groups either supporting or participating ranged from the Sierra Club to AVAAZ have been very pleased by the results. The main purpose of the event was to resonate with those meeting at the United Nation on Tuesday. world leaders from 125 nations, including Barack Obama, President Obama and world leaders from government, finance and business worlds will be at the U.N. to announce initiatives meant to move the world towards limiting global warming. While some may argue that we are too late for an international bureaucracy like the UN to make any effective change from where we are headed, citing past failures, back and the fact that "some of the most important world leaders" like Chinese President Xi Jinping and Indian Prime Minister Narendra Modi will be skipping the proceedings. These two nations missing this summit would be more than just a snub at the UN, it could be disastrous for any agreements made there. There are a few external trends that seem to be supporting the People's Climate march. Just today the news broke that Google was dissolving their ties with the lobbying group ALEC, a group that normally represents the dirtiest of oil interests. This was the culmination of an effort by a coalition of groups, spearheaded by eco-billionaire Tom Steyer backed Forecast the Facts. Adding to this interesting trend are some moves made by the energy industry. First, it is noteworthy that Six international energy companies have agreed to work to reduce emissions of methane, through a UN backed process. The hope is that these initial steps will resonate throughout the industry and eventually bring a change to the culture and practices. Second, the Rockefellers, a family that made most of their fortune through oil, have decided to shift more than $50 billion of their fossil fuel holdings and business to the clean energy sector citing the reason as clean technology and renewable energy are trending to be the future of the energy industry. The People's Climate march was a sight to behold and made me lament the fact that I was stuck on the west coast for this perfect storm of action. While the effects of the event, and the #FloodWallStreet protest, are still playing out, we cannot sit idly by waiting for the longer term effects to play out. Now is the time to contact your local representatives, citing this historic moment as a turning point. We, as a collective commons, have to protect our interest through paying attention to the activities of the UN, of our local government and by getting involved with events throughout the world. Those who have held a vested interest in the goings on in the Climate March need to continue the wave through participating (either in-person or virtually) with events like SXSW Eco happening next month or the IUCN World Parks Congress and the BLUE Ocean film festival and conservation event happening in November. We each need to continue the conversation, look to solutions and plan for the future. As others have noticed, we are at a crossroads of opportunity and need to dramatically change our economic model to something that supports us in the long run without decimating our home.